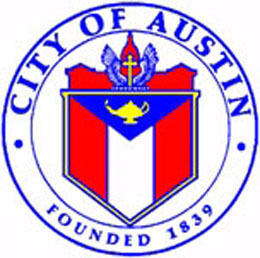 Many of the homes in Aldridge Place have been designated as Austin Landmarks. Usually these homes have the Austin Medallion placed on the front of the house, similar to the one shown above top right. There are benefits to the city for doing this as the property is protected from unsuitable development. The homeowner benefits from a city provided tax incentive. Several of the homes from the above flyer, promoting Aldridge Place, can be seen in the main photograph which is used as the masthead on all the web pages here. (Can you spot them?). All the homes shown above, can still be seen in Aldridge Place today.